Hi Tech Cleaning Services, have your windows cleaned using our water-fed poles. Clients turn to us to clean both domestic and commercial propoerties. Let the light shine in with crystal clear windows to brighten up your house. 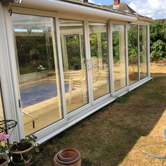 Not only will your home appear cleaner, clean windows will also enhance your views out over your garden, courtyard or balcony. Keep your windows clean all year round. You’ll be amazed by the difference! 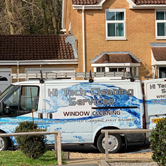 Our domestic window cleaning services, clean windows throughout Portsmouth, Southsea, Waterlooville, Horndean, Widley, Purbrook, Cosham, Drayton, Bedhampton, Cowplain and Denmead. We're known for spotless, clean, streak-free windows. But that's barely a speck on our full range of services. 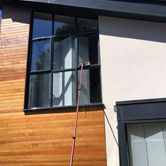 Our window cleaners make sure your windowsills and frames are free of marks and smears. We even remove cobwebs and dust from window corners. 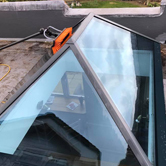 In fact, your domestic window cleaner will clean any glazed surface – including skylights, conservatories, solar-panels, and much more. From our very first interaction, you'll see why we're renowned for our customer focus. We'll arrange an appointment time that suits you. Our domestic window cleaner's will show up on time. In uniform. Ready to do a comprehensive clean. And we'll exercise maximum respect for your home and belongings - with minimal disruption. We've been using Hi Tech Cleaning Services for years to clean our windows and they always do a really efficient job. Very polite and friendly company to work with.